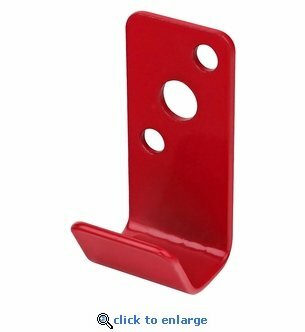 This Universal wall hanger is for 2.5 gallon water extinguishers, 6 Liter K-Class and other extinguishers with a slotted hanger brace attached to the extinguisher. Other extinguishers this wall bracket can hold may include 10-20 lb dry chemical and 13 lb halon extinguishers with the slotted mounting bracket on the extinguisher. Amerex wall hangers are quality manufactured of steel with a primed and powder coated paint finish.